TED Conferences LLC (Technology, Entertainment, Design) is a media organization that posts talks online for free distribution under the slogan "ideas worth spreading." 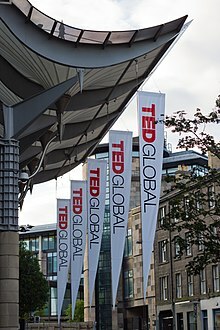 TED was conceived by Richard Saul Wurman in February 1984 as a conference; it has been held annually since 1990. TED's early emphasis was on technology and design, consistent with its Silicon Valley origins. It has since broadened its perspective to include talks on many scientific, cultural, political, and academic topics. 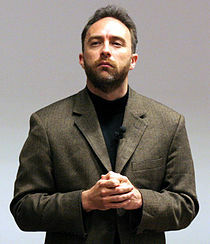 It is owned and curated by Chris Anderson, a British-American businessman, through the Sapling Foundation. In 2000, Wurman, looking for a successor at age 65, met with new-media entrepreneur and TED enthusiast Chris Anderson to discuss future happenings. Anderson's UK media company Future bought TED. 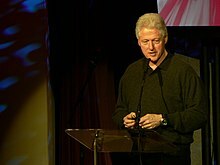 In November 2001, Anderson's non-profit The Sapling Foundation (motto: "fostering the spread of great ideas.") acquired TED from Future for £6m. 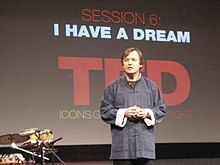 In February 2002, Anderson gave a TED Talk in which he explained his vision of the conference and his future role of curator. Wurman left after the 2002 conference. It used to be 800 people getting together once a year; now it's about a million people a day watching TED Talks online. When we first put up a few of the talks as an experiment, we got such impassioned responses that we decided to flip the organization on its head and think of ourselves not so much as a conference but as "ideas worth spreading," building a big website around it. The conference is still the engine, but the website is the amplifier that takes the ideas to the world. Also in 2010, noted statistician Nassim Taleb called TED a "monstrosity that turns scientists and thinkers into low-level entertainers, like circus performers." He claimed TED curators did not initially post his talk "warning about the financial crisis" on their site on purely cosmetic grounds.